Krakow is an impressively photogenic city that also happens to host one of the major photography events in Europe – Krakow Photomonth (Miesiąc Fotografii w Krakowie). Photomonth is organised by the Foundation for the Visual Arts. As well as producing festivals showcasing the best of world and Polish photography, one of the foundation’s goals is to preserve photographic archives that are at risk because they are not being properly cared for by any other society or institution. The aim is to acquire archives and then publish them, thereby creating a permanent national collection that documents the work of various Polish artists and the history of Polish photography. 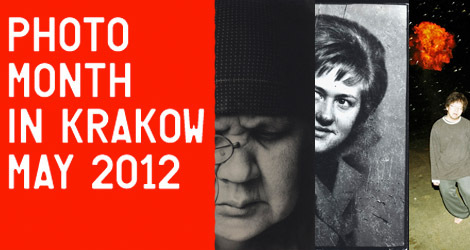 Krakow Photomonth has secured a place as one of the most respected photography events in Europe. The festival has grown from humble beginnings in 2002 and now attracts major exhibitions from world famous practitioners while continuing to support and encourage young, home-grown photographers. The festival strives to be innovative and has a reputation for using interesting and unique public spaces, such as a former brewery, the Schindler Factory, public washhouses and private apartments, as well as more conventional exhibition spaces. As well as individual and collective exhibitions, the festival also features a wealth of photography events including workshops, screenings, lectures and a portfolio revue. The accompanying ‘ShowOff’ section spotlights ten individual exhibitions selected by a jury from over 600 contenders. A free programme, in English and Polish, is available from the festival office, cafes and venues. The vast majority of the exhibitions are free, but a handful charge a nominal admission. The main program includes exhibitions by the following prestigious photographers. More details are available at www.photomonth.com.